Chausa or Chaunsa literally means “a sucker”. Once you start eating it, all restraint is lost and you find yourself sucking every drop of its heavenly nectar!! Some call it the gift-of-the-Gods. Chausa is also called the Emperor of Mangoes. There are a few variations of the Chausa, but the variety most closely referred to as Chausa is the “Chausa SB” or “Chausa Samar Bahisht”. This is the most delicate of fruits and extremely high in sweetness- most of the seasons this is the sweetest fruit that we import. When a Chausa has been consumed, life is not the same any more- one suddenly realizes the reason for existence. For many it is an out-of-the-body experience whenever they consume a Chausa. Do not be surprised if you are lost in joy for hours afterwards and people do not comprehend the continuous smile on your face. 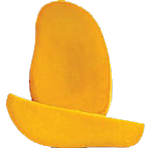 Mango color changes to light yellow on ripening. It is grown extensively in India and Pakistan. In India, the most famous regions are Malihabad, Saharanpur and some pockets in Maharashtra. In Pakistani, the chausa is grown in Multan and Sindh- the most famous being the Multani Chausa, which is excels in flavor and marvels in sweetness. The best season for this Mango is between start-July and mid-August.